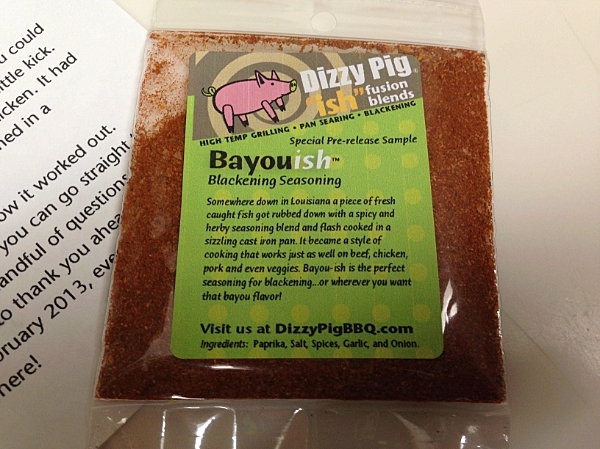 Dizzy Pig is back at it again adding to their “-ish” rubs with the new release Bayouish. Once again, they’ve sent me a sample before they release it to try out. I honestly don’t know why they choose to include me on their little list of people who get to sample it first, but I am glad they did. Along with a small sample, they sent a little note. Enough of all that. Time to get cooking. Preheat your grill to hot. We had the Big Green Egg going steady at 650F. 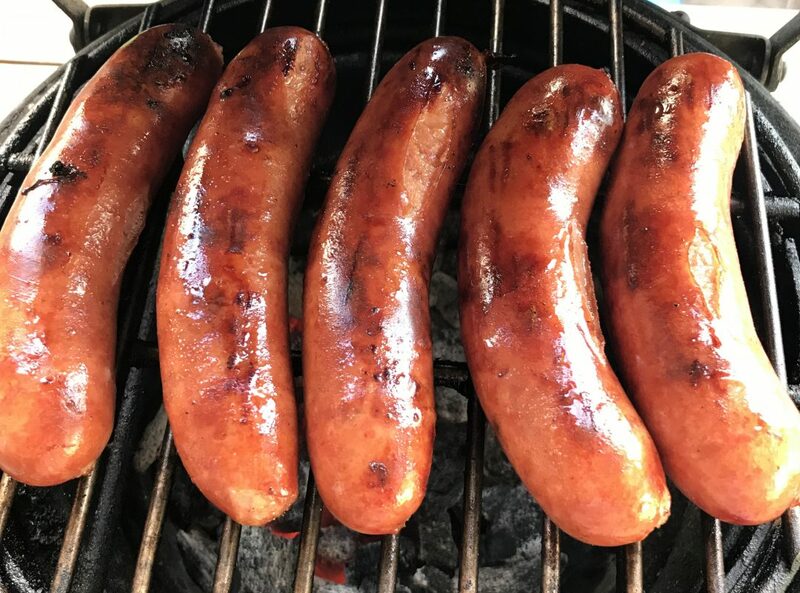 Allow your cast iron skillet to come up to heat with your grill. 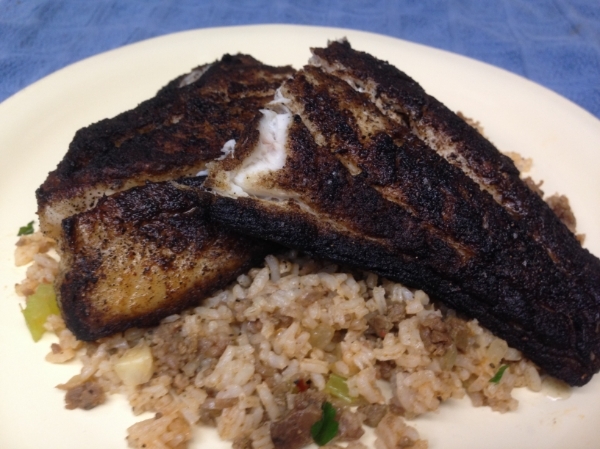 Brush both sides of your fish with melted butter and apply Bayouish liberally. Reserve remaining butter. 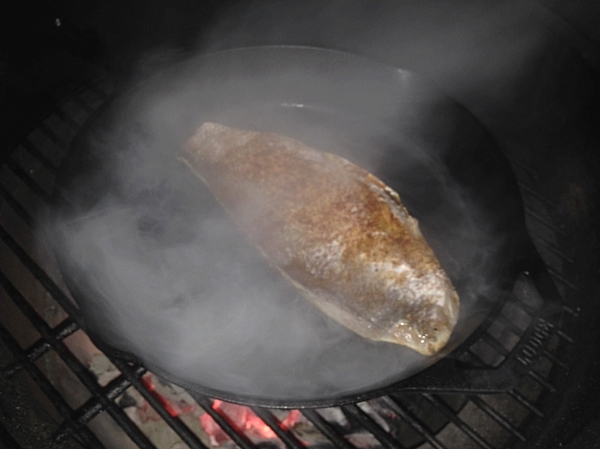 After allowing your skillet to get “screaming” hot, carefully pour in a tbsp or so of butter and put the fish flesh side down. After two minutes, flip the fish and pour in another tbsp of butter and drizzle some on top of the fish. 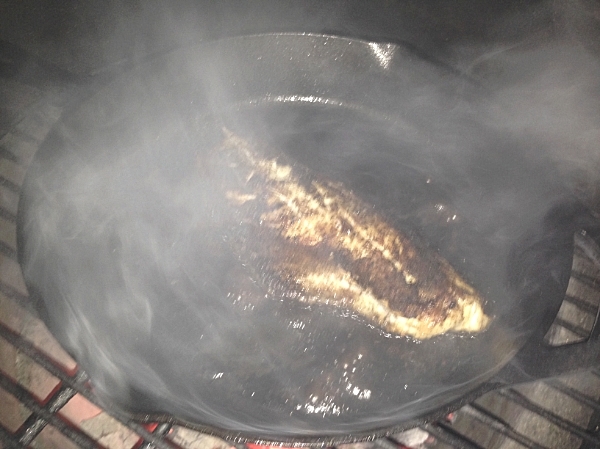 Cook for another two minutes or until fish is about 130F. Remove fish from skillet, squeeze lemon juice on top and enjoy. Look at all that smoke!! Now why would you want to blacken your fish outside? Couldn’t you just do it inside? Check that above pic. See all that smoke? Can you imagine how smoky your house would be after that? This dish is better prepared outside so you don’t smoke out all your family, friends and/or pets. Fresh off the grill…er…I mean cast iron skillet. Sometimes, I don’t know what I would do without Mrs. G. She found a recipe somewhere and whipped up some dirty rice to go along with the fish. Not sure what all went into it except hot breakfast sausage, chicken livers (we had some left over from the risotto), celery and rice. Whatever it was, it was tasty. Plated up and ready to eat. The red snapper was pretty darn tasty and I can see us using Dizzy Pig’s Bayouish often once they officially release it. 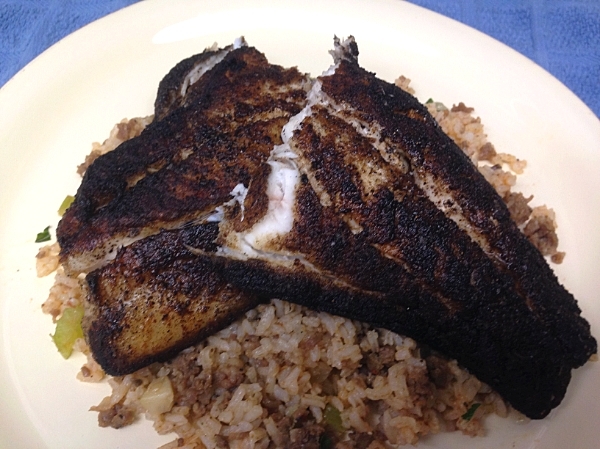 It had a nice flavor and didn’t overpower the fish at all. If anything, Mrs. G and I both wish it had a bit more spice to it. I understand when marketing to the masses, you have to please a wide range of palettes, but the heat was just lacking in our humble opinions. Nothing a little hot sauce won’t fix. Or mixing in a little cayenne to the rub. Otherwise, the flavors were pretty well balanced. 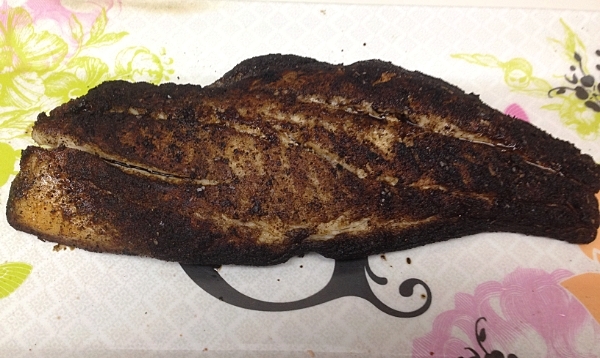 If you like really spicy food, this might not be the rub for you, but if you are addicted to blackened fish, you should give it a try. Ah man, that looks outstanding. 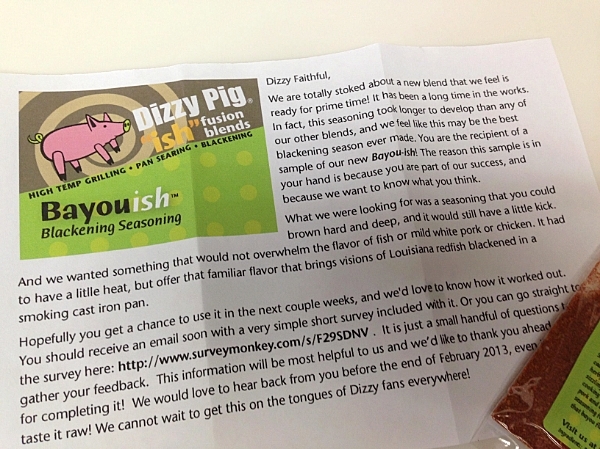 I’ve yet to try the dizzy pig stuff, but I sure hear a lot of good things about it. Nice little write up! They put out some nice rubs. You should give some a try. Now I’m seeing a blackened po’ boy in my near future!